Along with putting on in-house events, we have two great multi-functional, high spec spaces available to hire. Betty, our large studio space, and Mike, our meeting room, can be used for performances, live music, meetings, launches, film and photography shoots and much more. Hire a space at Poplar Union and you’ll also have the option to make use of our excellent general facilities: our in-house café, e5 Roasthouse; catering*; showers; lockers; baby change facilities; and full disabled access. Our office opening times are 9am – 5pm, Monday to Friday, but we will occasionally be open for shows and bookings outside of these hours. If you require access to the venue outside of regular opening hours, please let us know by calling 020 3039 3333. At 16.5m x 9m, Betty’s a big girl and, with a state-of-the-art AV system, she’s the perfect space for theatrical performances, live music events, film screenings, launches and more. Betty is separated from our café area using a 59dB rated partition wall, so you ‘ll be able to move between areas – but sound won’t. Fully automated blackout blinds for presentations, film screenings, etc. At 5.3m x 5.3m, Mike’s smaller than Betty but just as functional and ideal for meetings, presentations, yoga classes, rehearsals, auditions and more. Let us know what you want and we can set him up to fit your needs! *Please note that catering and the use of some technical equipment will entail an additional cost. If you’re interested in hiring a space at Poplar Union, please fill out the form below and one of our team will be in touch. What sort of event are you putting on? What date are you looking to hire the space? How much time will you need in the space? 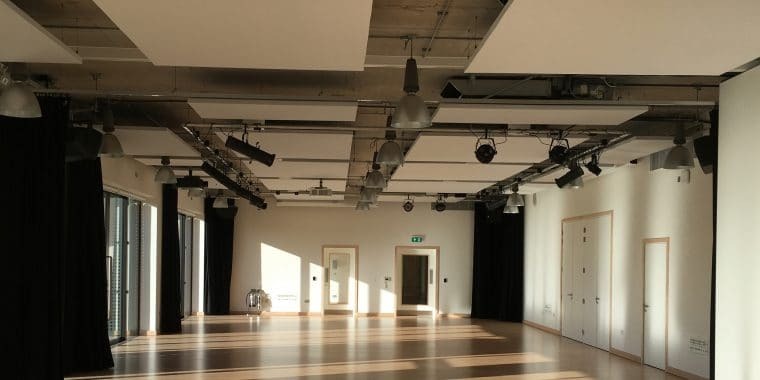 If you wish to see our full terms and conditions, book an appointment to view the spaces or request a complete technical specification, please email hire@poplarunion.com or call 020 3039 3333.